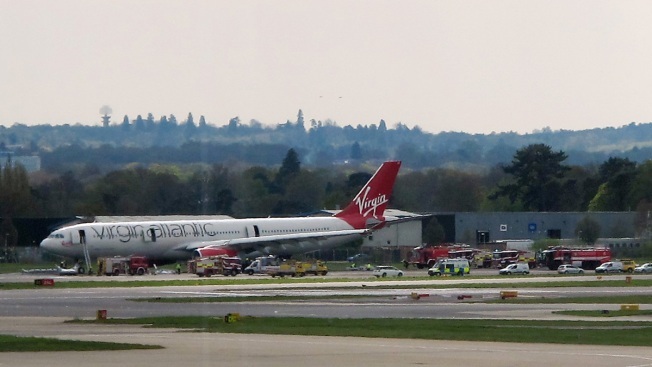 In this April 16, 2012, file photo, a Virgin Atlantic aircraft stands on the tarmac at Gatwick Airport in London. The airline said the 448 passengers — who were returning to Britain after traveling on the MSC Preziosa cruise ship in the Caribbean — and crew were taken to a reception center near London Gatwick Airport for medical assessment after the plane landed. It said a number of customers had "reported feeling unwell onboard" and that it is conducting a full investigation as to what happened. Passenger Trevor Wilson told The Associated Press that paramedics initially checked people on board and then the entire group was bussed to the reception center for more assessment. "They basically quarantined us," said Wilson, 61. "From the time we touched down till the time we left it was about five hours. I have no problem with Virgin or Gatwick's response. This doesn't happen often." He said he was not sick but that his partner had become ill three days into the two-week cruise. He said he believes the problem must have originated on the cruise ship, not the plane they flew home in. "We didn't notice a lot of people sick on the cruise, but when we got on the plane coming it was really bad," he said. "Loads of people coughing, and members of the crew became sick, that's when they alerted ahead." A South East Coast Ambulance Service spokesman said it treated about 30 people with various complaints and that three had been taken to a hospital for further checks. The service said it responded with specialists and its Hazardous Area Response Team because passengers and crew were feeling "unwell and nauseous." Swiss-based cruise line MSC Cruises, which operates the ship, said the company is investigating and seeking reports from doctors treating the passengers. The company said there have been no cases of acute stomach ailments on the cruise ship in the past two weeks.